I planted asparagus crowns last spring. Asparagus crowns look like dried out root clumps. At the end of last summer, I started finding little shoots around where I planted the crowns. Those shoots grew plants about three feet tall with lots of fine leaves. Very pretty. Do not harvest your asparagus the year you plant it or the year following planting. 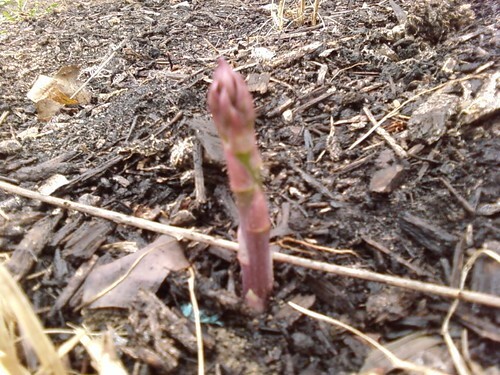 The asparagus plant needs to grow and establish a healthy crown and it will need all of its energy to do that. The third-year after transplanting we generally harvest the field for about two weeks. I found a few more shoots in other places. This is really exciting. Only one more year to go before my harvest! This entry was posted in gardening by matt. Bookmark the permalink.